The great rabbit turd conundrum is really the least obnoxiously obtuse thing about the whole affair though as the film barely takes time out from its strictly amateurishly disjointed presentation peppered with references to Alice in Wonderland, over the top moments like Wincott fighting his wife with a toilet plunger, Maria Ford scrunching her face into shrewish expressions while shrieking at Wincott, and the seemingly random insertion of scenes from an entirely different movie to ever get around to explaining just what in the hell was going on with the embryos Wincott was trying to save the world with while his wife (Ford) was trying to kill him and steal them for the evil general. Like an embryo accidentally left out overnight in a Petri dish, Future Fear putrefies right from the beginning when we see Wincott in a baby blue helmet piloting a helicopter while his wife is chasing him in a red helicopter while wearing a silly red outfit complete with red helmet that has an eyepiece on it whose only purpose seems to be that of obstructing her vision. The chase is only notable for Wincott’s hopefully ad-libbed dialogue such as “see ya, wouldn’t want to be ya!” and for the badly done special effects involving an explosion (which is unashamedly shown again about 10 minutes later!) and the hard landing Wincott’s helicopter is forced to make. Wincott plays Dr. John Denniel, a scientist who is enlisted by the government to try and find a cure for a virus, brought by a comet, that has almost wiped out the entire population on Earth. Ford is another scientist, Anna, who John is married to and they work together on the project. They come up with the idea to genetically engineer an embryo that mixes human DNA with some other animal’s DNA with the idea that the resulting monstrosity would have some antibodies they could extract and make a serum to combat the virus with. It’s a pretty simple story. Stupid, but still simple. But John is also haunted by the death of his father decades ago! And he has strange dreams about it. And he sees a girl with a Humpty Dumpty doll. And he is convinced that the evil general played by Stacy Keach (sorry for mentioning you by name, Stacy!) had something to do with his father’s death. Even worse than his unhealthy obsession with his dead dad is his unhealthy obsession with Alice in Wonderland! Did you ever watch Jeff Wincott in his regular old bland kickboxing movies like Martial Outlaw or Open Fire and think yourself, “it would be so cool if Wincott was doing all this while dressed as the Mad Hatter!” Well, it turns out to be one of those ideas that’s a lot better on paper than film. John and Anna have a falling out right around when she has a miscarriage and she becomes convinced that the embryos should be allowed to grow all the way into whatever the hell they’re going to turn into! Somehow she starts working with the general (he orchestrated the comet virus disaster in the first place, though for what reason I can’t recall) and much of the movie that I could actually makes heads or tails of is John and Anna chasing each other through some underground bunker trying to get the embryos. 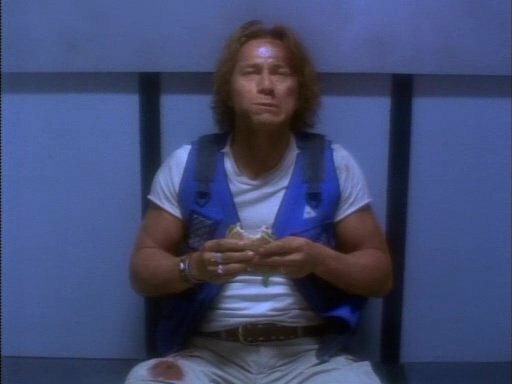 Wincott seems to be playing everything for laughs, making allegedly witty comments here and there while getting into wild and crazy situations like sticking his foot in a toilet, or making a sandwich in the middle of the big embryo search mission and even screaming over and over at the top of his lungs while trapped in a bar with an electrified floor before somehow making a homemade flame thrower and escaping to harass his wife with it! For her part, Ford is merely just about the most annoying thing ever committed to screen with her constantly haggish demeanor. Combined with the absolutely dimwitted decision to keep using quotes and imagery to suggest some connection to Alice in Wonderland where there really wasn’t any make everyone in this film not just an embarrassment to all of cinema but to all dramatic performances dating back to the first time a caveman used his hands in front of the fire to make shadows on the cave wall to spin a yarn. Judging from your reviews, would you say Jeff Wincott is the worst martial artist actor? In the same category we have Steven Seagal, Michael Dudikoff, Steve James, Gary Daniels, David Bradley, Olivier Gruner. I’m not counting here either Van Damme or Chuck Norris, since both IMO have at least managed to retain their self respect. I haven’t seen Wincott, but from your comments he seems to be very, very, VERY bad. Of the people you listed, I think Seagal is far and away the worst. The guy hasn’t even tried to do a good job in close to 20 years and yet he just keeps pumping out 3-4 movies a year. He’s really in a class by himself as far as terrible martial arts actors go. As to the rest of the pack, Wincott isn’t really noticeably worse than Gary Daniels or David Bradley, he’s just hampered by the awful movies he’s been in. I don’t think Bruce Lee or Jackie Chan could have saved Future Fear! I would put Olivier Gruner below all these guys. No personality and distracting accent and appearances in things like Power Elite and SWAT Warhead One that barely qualify as movies don’t do him any favors. Any doubt he is the worst of the list is put to rest once you watch him as a horse farmer in The White Pony. Some guys you didn’t mention: Richard Norton – never has let me down and was always working hard in his movies. Don “The Dragon” Wilson – as prolific as he was generic. Jeff Speakman – like Dudikoff made a couple of entertaining pictures in The Perfect Weapon, Street Knight and The Expert and had the kenpo thing happening to differentiate himself. Jerry “Golden Boy” Trimble may give Gruner a run for worst from what I’ve seen, but to be fair I haven’t seen all of his films yet. There’s also Dale “Apollo” Cook who made several martial arts movies in the early 1990s but I haven’t gotten around to see any of them. Thanks for your answer! Wow, glad to learn Ol’ Steve still is at the top…of something! Steve James always seemed to be having a blast in whatever role he played. Dudikoff too, and he strikes me as a very nice guy in real life, the kind of guy who would laugh at his own movies without any problem. You mention a number of important actor I ommited. I saw Norton in a ton of crappy italian movies. It’s difficult to judge his performances aside from the terrible movies he starred in, but he seemed to be way better than the material he had to play, if that counts as a compliment. Speakman, on the other had, I heard was/is more than a bit full of himself. Don’t know it it’s true, but never liked his movies, they seemed too generic and forgettable. Wilson was a bit better, but he faded in obscurity. As for Jerry Trimble or Dale Cook, I never heard of any of them before. Sound bad enough to be worth of checking out. For the record, what do you think of Michael Sopkiw? The guy was no martial artist, but he did quite good starring in awfully goofy movies like After the Fall of New York and such. I liked Sopkiw, but he did have the benefit of being some really fun trash with After the Fall of New York, Massacre in Dinosaur Valley and Monster Shark. That said, he looked like was having a good time in those movies or at least understood the type of movies he was in.